Ask which were the first landscape paintings in Western art, and most would suggest works of Dürer (1471-1528) covered here, Albrecht Altdorfer (1480-1538), or perhaps the first great exponent of landscapes, Joachim Patinir (1480-1524). But they were actually very late compared to frescoes of the Cycladic civilisation, some three millenia before. Cave paintings, the earliest paintings known in Europe, show exclusively animal and human forms, and lack even the most rudimentary indication of any landscape as such. 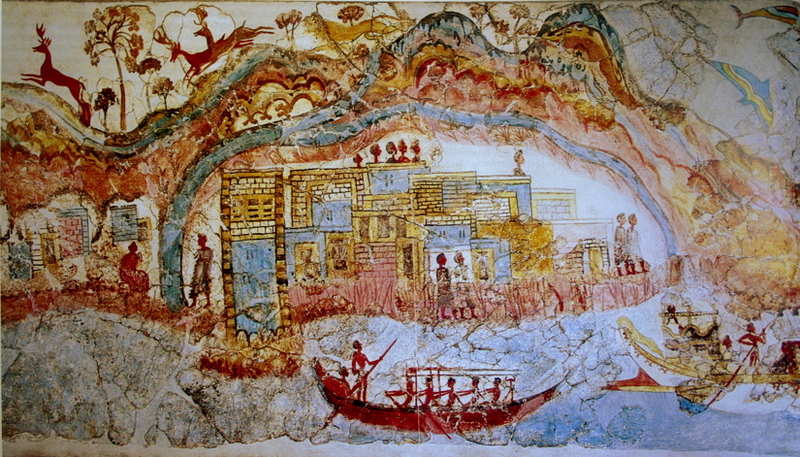 At the moment, the earliest paintings which are clearly landscape in nature are those from the Cycladic civilisation on the Greek island of Santorini (Thera), which was destroyed by a huge volcanic eruption in about 1627 BC, engulfing the buildings and preserving them much in the way that Pompeii was. We can therefore be confident that its wall paintings were completed before that date. A general account is in Wikipedia, with more specific detail on the Akrotiri site here. 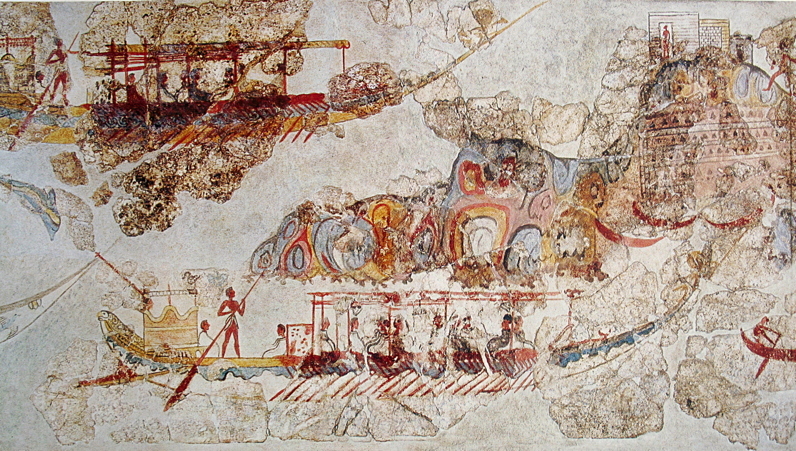 The most spectacular among them is known at the Flotilla Fresco (or Frieze), and is a panorama showing a flotilla of boats making their way from one port to another. The ports themselves are shown in considerable detail, with their hinterland, as seen in the details here. 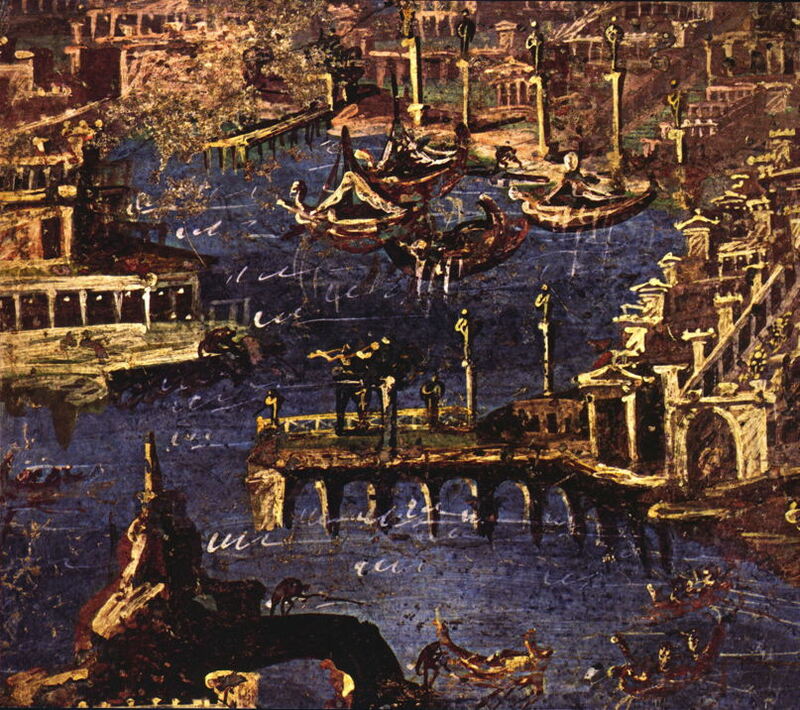 Although its location and interpretation remain the subject of debate – you can read more in Strasser’s paper – this fresco is clearly a landscape of the sub-genre waterscape. If you are still unconvinced of its nature, another contemporary Theran fresco shows the landscape around the Akrotiri River. More details of flora and fauna are shown in the Spring Fresco too. Sadly the frescoes from Knossos are too fragmentary to determine whether any contained landscape images, and the Greeks focussed almost exclusively on figurative works. There is thus a gap in the records of further landscapes of about a millenium. However the Vergina Hunt Fresco of 340-300 BC, whose main subject is clearly the hunt, contains substantial landscape passages, including trees and topographic detail. Initially Roman art took its lead from the Greeks, and was strongly influenced by their emphasis on figurative subjects. 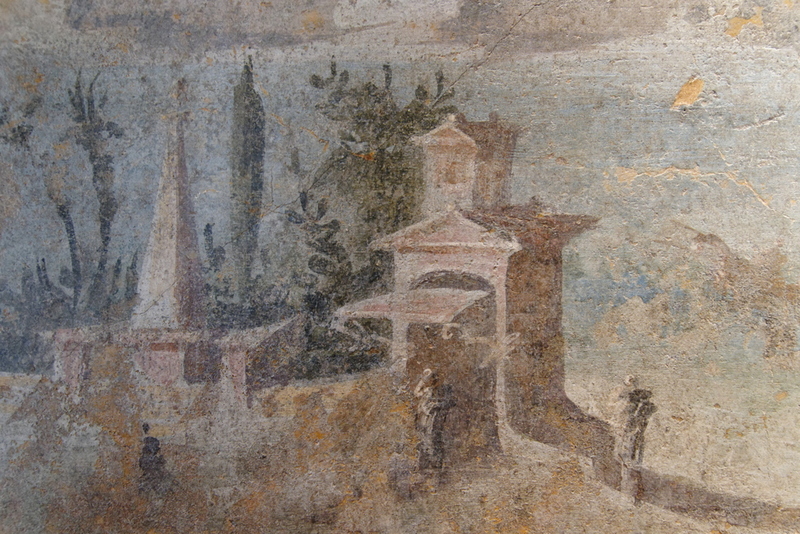 However richer evidence available from frescoes preserved in various villas and other buildings shows a surge in popularity of landscape subjects as Roman painting developed. It is hard to know whether this occurred by progressive reduction in the size and significance of included historical or mythological figures, as with Poussin and later landscape more generally. Anonymous, Sea Landscape (before 79 CE), fresco, 42 x 72 cm, originally from the Villa at Boscoreale, Italy, Musée du Louvre, Paris. By Marie-Lan Nguyen, via Wikimedia Commons. 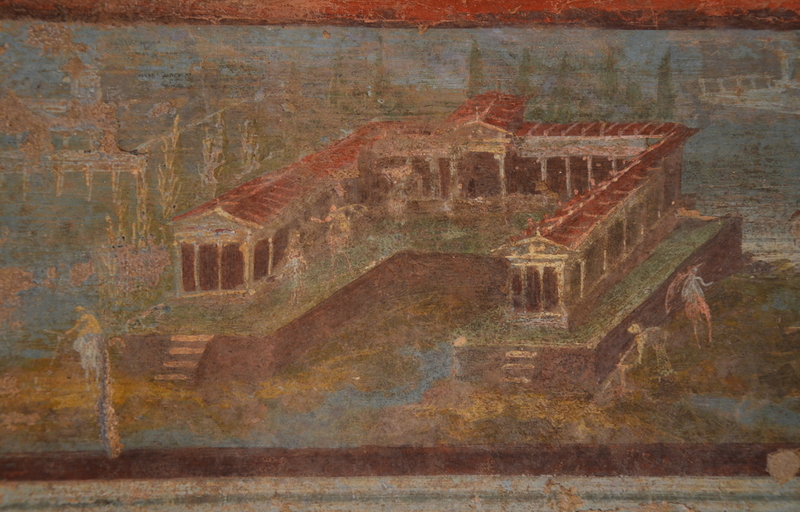 However by the first century CE, when many important sites were preserved by the eruption of Vesuvius, pure landscapes with no discernable narrative content were to be found on the walls of several villas. Anonymous, Port Scene (before 79 CE), fresco, originally from Stabiae, near Pompeii, Museo Archeologico Nazionale di Napoli, Italy. By WolfgangRieger, via Wikimedia Commons. Further information and images of some of these are in the Metropolitan Museum of Art’s Heilbrunn Timeline of Art History here. Anonymous, Maritime Villa with Fishermen (before 79 CE), fresco, originally from the Temple of Isis in Pompeii, Museo Archeologico Nazionale di Napoli, Italy. By Carole Raddato from FRANKFURT, Germany, via Wikimedia Commons. Strasser TF (2010) Location and perspective in the Theran Flotilla Fresco, J Mediterranean Archaeol 23.1:3-26. Available here. Posted in Painting and tagged Akrotiri, flotilla, fresco, history of painting, landscape, painting, Pompeii, Roman, Santorini, Thera, Vergina. Bookmark the permalink.